They waited until almost the end of Trudeau's stump speech before stepping out from among a group of supporters and Liberal candidates who stood behind their leader. 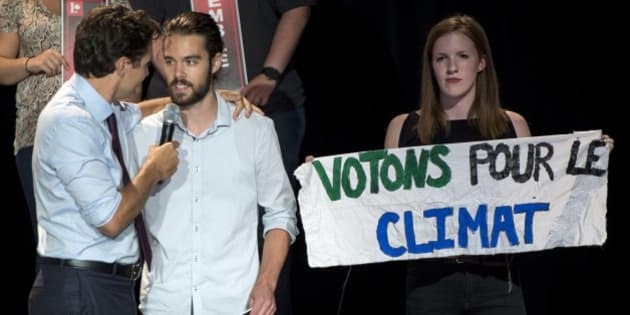 MONTREAL — A pair of climate change activists put Justin Trudeau on the spot, unfurling a banner on stage and demanding action during his Friday evening rally with Liberal party supporters in east-end Montreal. The homemade banner read: Vote for the Climate. Sam Quigley, who claims not to be part of an organized group, wanted to know what proposals a Liberal government would take to the United Nations climate change conference in December. At first, Trudeau seemed startled to see them, but took the microphone over to Quigley and in response he said his plan was to gather all of Canada's premiers and take them to Paris in order to present a united front. Quigley and Laura Cameron say they weren't satisfied with the answer and hoped to hear some specific target numbers to reduce CO2 emissions.